Photo: Arthur Orchard – fishing boats off the Eaglehawk Neck jetty. 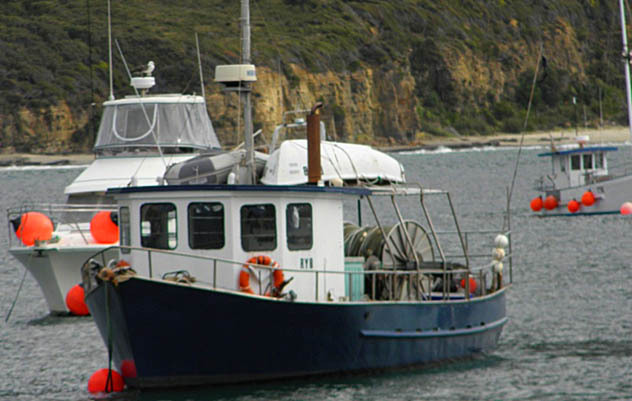 Eaglehawk Neck is home to a small commercial fishing fleet, mostly catching crayfish up and down the coast. Several private charter boats are based here offering fishing or sight-seeing tours. Then there is the constant stream of recreational fisherman launching or retrieving their boats from the four ramps available. During the Tuna fishing season from December to the end of June there is often a sense of organised chaos with all the activity; especially on the several occasions each year that the Tuna Club of Tasmania hold competitions. There are never enough trailer parks. Before you go out always check the weather and tide.